Spiritually sensitive hospice care occurs through patient relationships with staff who can discern, assess, and help meet patients’ spiritual needs at the end of life. It is common for patients in the United States to rely on religion and spirituality to help them cope with terminal illness. Even if a patient is not religious or a spiritual person, spiritual needs can be just as important as other needs at the end of life. Providing spiritual care can help a patient regain a sense of purpose so spiritual healing can occur before death. Providing spiritual care is often reserved for a patient’s religious leader, volunteer clergy, or hospice chaplain. Nevertheless, there are times when a patient and his or her family need ongoing spiritual support, particularly when a spiritual care provider is not available or a patient refuses referral for spiritual care. Hospice care and related providers typically rely on the helping relationship to facilitate patient comfort at the end of life. The provision of spiritual support is one aspect of this relationship, so it is important to consider what aspects of the helping relationship can be spiritually supportive. The concept of spiritual sensitivity lends insight into this form of care. In Spiritual Diversity in Social Work Practice: The Heart of Helping, Canda and Furman describe spiritual sensitivity as “a way of being and acting throughout the entire helping process.” This concept has been extended in this article to include spiritually sensitive hospice care, which is relative to a hospice worker’s ability to enhance patient life meaning or spiritual well-being. Excerpts from a recent survey are used in this article to explore what it means to provide spiritually sensitive hospice care. Sixteen nonpastoral hospice workers with at least six months of hospice experience volunteered to participate in a semistructured telephone interview lasting 45 minutes to an hour. Almost all respondents had a Christian religious orientation. The majority were female and worked full time. About one-half of the respondents had an undergraduate degree and one-half had a graduate degree. There were slightly more respondents employed as social workers than those employed as nurses, with two being in another type of position. The median number of years of professional experience was 12 with five years of hospice experience. 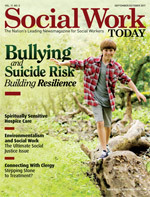 Survey results suggested spiritual sensitivity was relative to the worker’s ability to prepare for providing spiritual care, assess patient readiness to address spiritual needs, engage patients in spiritual assessment, discern patient spiritual needs, refer patients to a formal spiritual care provider, and communicate spiritual sensitivity through interpersonal support. Spiritual sensitivity further involved a respondent’s assessment of a patient’s readiness to address spiritual needs. One respondent described the reaction of a patient who was not ready to discuss spiritual needs. The patient said angrily, “I don’t want to hear anything about that God stuff. Don’t bring that God stuff in my residence again.” The patient continued to be irate despite the respondent’s apology. Respondents suggested using simple language to begin a spiritual assessment. This style was compared with a “back-porch conversation” where you “ask the right questions to get the patients more comfortable … until they begin to open up.” This can lead to the hospice worker being able to ask more specific questions of the patient. Spiritual assessment was the most basic form of spiritual care delivered by hospice workers. Respondents indicated that spiritual assessment questions were integrated into admissions and other paperwork maintained in the patient chart for reference. It was not uncommon for respondents to return to spiritual assessment questions when spiritual needs emerged. The provision of formal spiritual care usually involved referral to the patient’s religious leader or hospice chaplain; however, there were times when patients refused referral and requested the respondent to provide spiritual care. This required providing of informal spiritual care, which involved the communication of spiritual sensitivity through interpersonal support. The communication of sensitivity through interpersonal support consisted of nonclinical and clinical interventions. These interventions were often combined in the process of providing spiritual care. Nonclinical interventions included recognizing patient personhood, being present, therapeutic touch, singing, and listening. The second set of interventions associated with interpersonal support seemed clinical in nature because they required more expertise to communicate spiritual sensitivity. Clinical interventions were reframing, affirmation, self-disclosure, normalization, and advocacy. This study began to clarify the meaning of spiritual sensitivity in hospice care. Spiritual sensitivity required a willingness to address patient spiritual needs and ability to assess patient readiness to address their needs. Prayer seemed to help some respondents prepare to provide spiritual care. Taking time to determine patient readiness helped minimize violation of patient boundaries. Spiritual sensitivity was further communicated through the respondents’ ability to engage patients in a spiritual assessment, determine patient spiritual needs, and make an appropriate referral for additional spiritual care. Some patients refused a formal spiritual care referral, which fostered alternative spiritual care interventions that communicated spiritual sensitivity. Nonclinical interventions included recognizing personhood, being present, therapeutic touch, singing, and listening. Clinical interventions included reframing, patient affirmation, self-disclosure, normalization, and advocacy. Clinical interventions seemed to require more expertise to communicate spiritual sensitivity. Study results further suggested that patients solicited spiritual care from nonpastoral hospice staff likely based on the strength of their relationship, which led to a meaningful experience for both the worker and the patient. This finding emphasizes the importance of spiritual sensitivity from any hospice staff member, as he or she could be the last one the patient talks to before passing away. — Ann M. Callahan, PhD, is an assistant professor of social work at Lincoln Memorial University in Harrogate, TN.